Despite the fact that this crumble contained bananas - the most repugnant fruit on the planet, I found it was rather tasty. It is a much better use for a banana than banana bread. It was quite easy to put together and baked up in no time. My only issue was with the streusel topping. Imagine my surprise at that, considering that I absolutely adore streusel toppings. I found this one to be a bit too heavy on the butter, though. It really did not make that much of a topping. I felt the butter melted into the filling and did not make a crunchy topping - and that is what I feel streusel should do. In fact, I only used one-half of the streusel on this dish. I saved the other half and mixed it with some oats, flour and additional pecans to make a topping for a blueberry-peach crisp I made last week. Sorry - forgot to take photos of that. It was delicious. As easy as this is, I cannot imagine myself ever making this again. I despise bananas and I am not overly impressed with the mango. In fact, I am going over to the despising side of mangoes simply because I find them so annoying to cut up. I don't have a mango cutter and I am not going to invest in one just for the few mango recipes that Dorie uses. So, I'm always trying to slice right up against the seed and I either don't cut deeply enough or I cut too deeply. I was glad to find, however, that there is a method to making bananas more palateable. Sorry about the lousy photo - it was night and I was tired - plus I am not a good food photographer. Maybe one day . . .
Wow, time really does fly, doesn't it? No matter if you are having fun or not - before you know it a month or more has gone by and you haven't posted a notice. 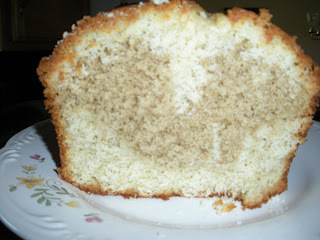 As per usual, I have been baking (for the most part) along with the group, I just haven't been posting my results. I made this cake several weeks ago and took it into work with me. It was highly popular, moist, tender and chock-full of berries, in fact, I think the next time I make it, I may cut back a tad on the berries. It was so popular my only photo is of an empty pan! I have been hoarding the last of my Agriberry asparagus to make this salad. I finally remembered to buy eggs at the Farmer's Market this week. Last night I made half this salad for dinner. As I love dressing I made the entire amount of that. I used about half of it last night and the rest on my luncheon salad today. Normally, vinegrettes are not my favorites but this one was really good. I was not able to find sherry vinegar so I subbed in cider vinegar and it was quite tasty. 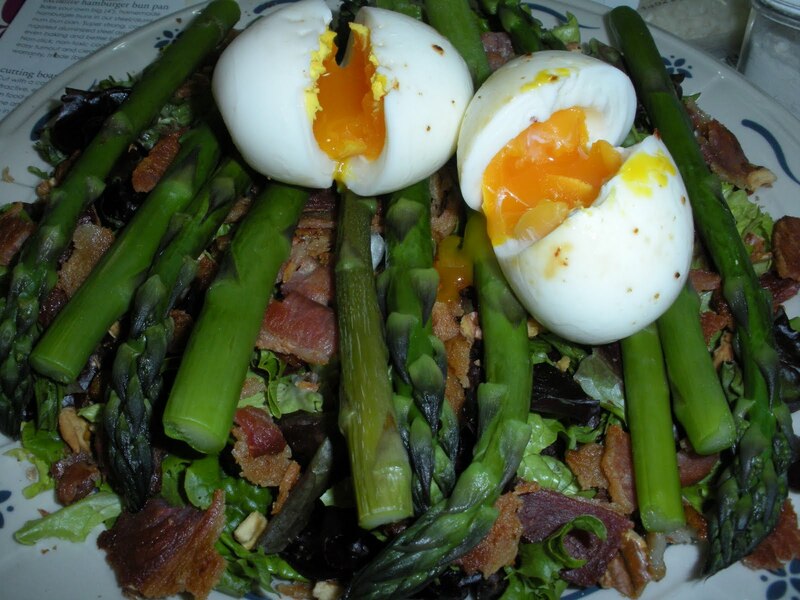 Farm fresh eggs, thick sliced bacon, yum!! Either Dorrie likes her asparagus cooked more than I do or her thicker spears were/are a lot thicker than mine, but I found four minutes to be far too long to cook the asparagus. I don't generally boil asparagus, I usually steam it for about two minutes but I went ahead and boiled it for four minutes. I definitely thought it was overcooked. Other than that, I was delighted with this salad. 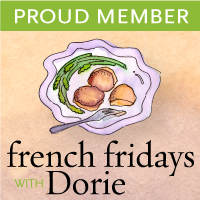 I am not a soft-boiled egg kind of gal, so I faced that idea with a bit of a queasy stomach, but I trust Dorrie and persevered. I thought my eggs were so pretty. How bright and colorful are these yolks? They are almost orange! If it has an influence (and to the best of my knowledge, it does not) these eggs were brown shelled. The salad greens I used came from the BJs superstore. They were sold in a large tub (isn't everything?) and marked artisan lettuce (I believe). At any rate, the tub contained some six heads of different "exotic" lettuces which were/are quite lovely. It contained a head of frisse, two heads of something with reddish leaves and three heads of some other green lettuces. I am (obviously) not a lettuce officianado so I do not know the other particulars. If the list of lettuces contained was printed on the packaging, I never noticed it. However, I am quite enjoying this selection and do highly recommend it. I used thick sliced bacon - I think it is Oscar Meyer - just some grocery store brand, but it worked out quite well, also. When are they going to invent the ability to send odors across the internet? You would swoon to smell this fragrant rice dish. It was divine. 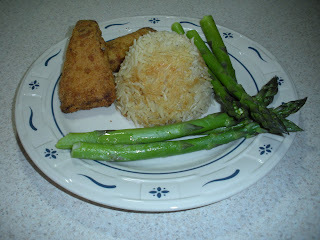 I served it with tender asparagus spears and baked fish fillets. Yummy. I don't remember how many servings Dorrie told us to expect, but I got two. I had half the rice for dinner and the other half for lunch the next day. Did I tell you I love cardamom? Yep, it is my fave. It even makes rice, which is generally a chore to consume, quite the pleasure. I make have to try cardamom mashed potatoes - it doesn't sound very appealing - but really - two great items? It must be killer - I will let you know. You know what the problem with doing the recipes ahead of time is? You forget to post them on time. I must work on my timing. It is abysmal. I am somewhat ahead of the recipes for June, also. Anyone care to take bets on when these little devils will be posted? 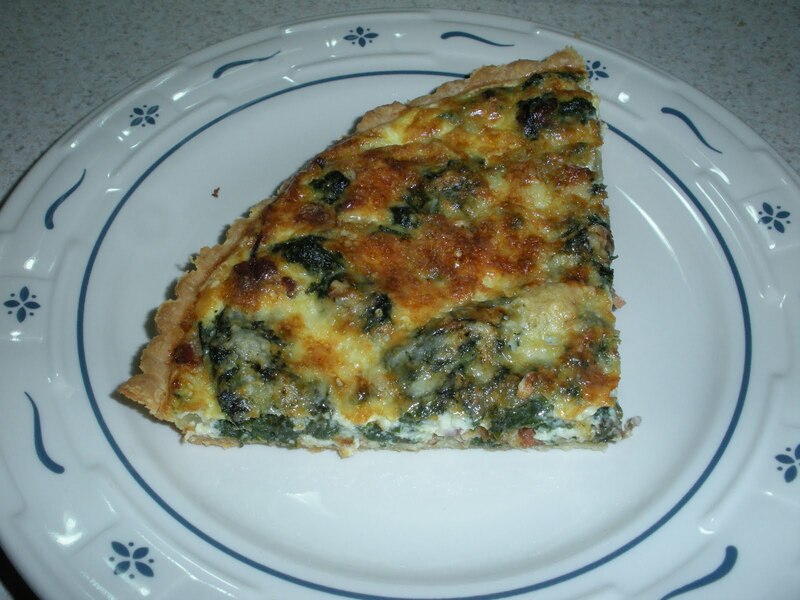 Spinach and bacon quiche. I enjoyed you immensely when I parook of you, lo these many weeks ago. I recall you were ridiculously easy to toss together. I had only one minor issue - well, okay two. As is ususal for me, my crust refused to my instructions not to slither down into the pan. What do I have to do to get a crust that remains firmly upright in my tart pan? I know, I know Dorrie the crust goddess implores me not to pull on my crust as this pulling will show up later as shrinkage. I try, really, I try to gently lay the crust into the pan, to ease the excess crust around the pan and to allow ample time for cooling in the fridge or the freezer. I thought I had done all of these things, but shrinkage I had. 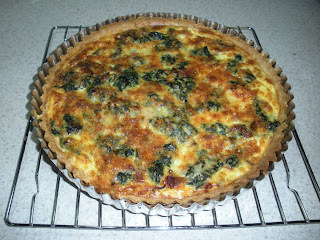 I also had a mighty tasty shell for my quiche so all is not lost in my land of tart shell assemblage. I shall continue to endeavor to create both a beautiful and tasty shell in the future. But, until both of these qualities merge for me, I am grateful that I at least have the later down pat. ﻿ I prefer my quiches to be of the plumper filling variety. 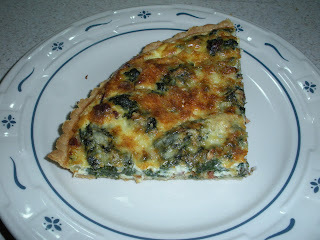 I did find that my cravings were not satisfied after eating a serving of this quiche. 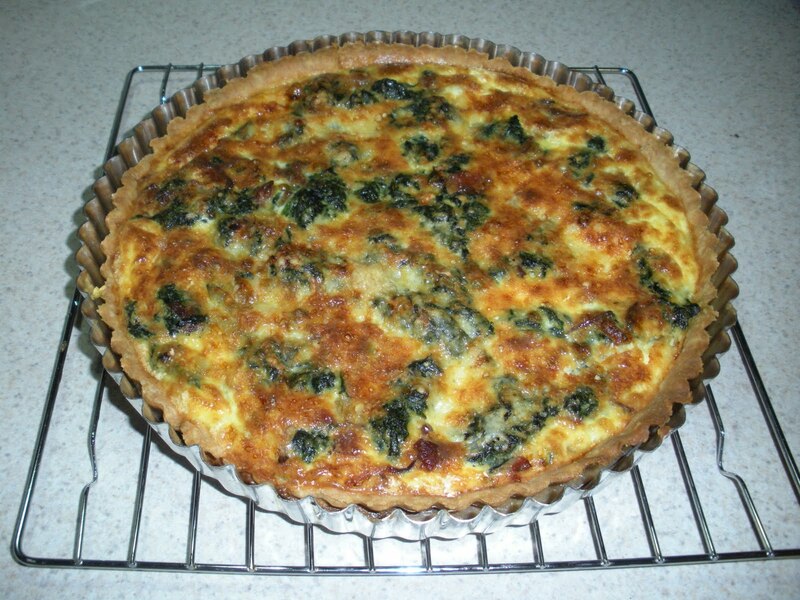 I would very much recommend accompanying this quiche with a salad or you will be back looking for more fairly soon after eating your fair share. With all of the bacon and spinach - you can see there was little room for the egg! These may be my favorite scones that we have made so far. I thought they were incredibly delicate in flavor and texture. 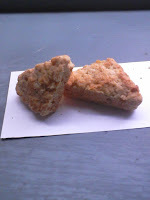 I made mini-scones, stealing the idea from one of the other bakers. I 've had my mini-scone pan for a number of years, but I don't use it very often. I love the idea of mini-scones, but I hate cleaning the individual little indentations of the pan. It might not be such a pan if the pan weren't so heavy, but it is and they are, so mini-scones don't hit my play plan all that often. 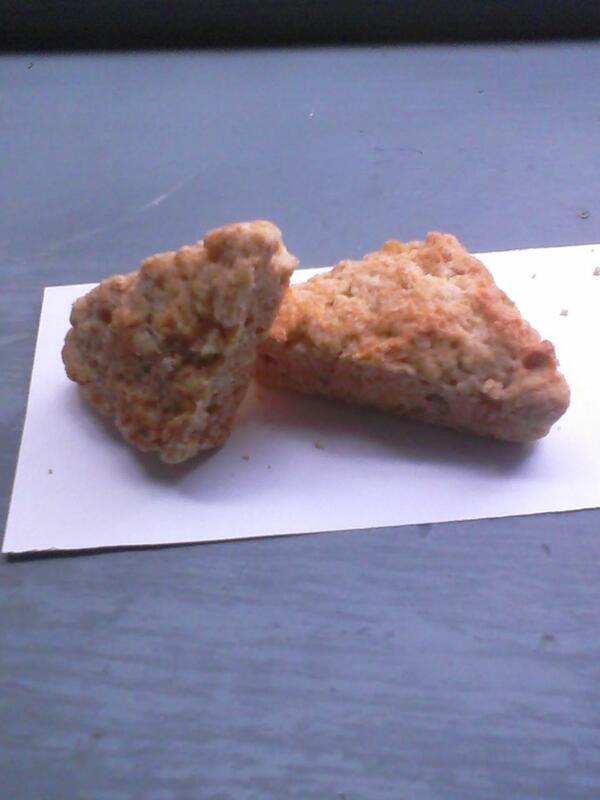 I have got to stop being such a lazy slob because mini-scones are absolutely adorable. I checked my stash of dried fruit and all I had were a variety of raisins, none of which struck my fancy and some dried pineapple, dried paypaya and dried banana chips - I found the thought of any of those repugnant with nutmeg, so I elected to stick with the recipe as written. I was very glad I did. The oatmeal sort of stuck up on me and would give a bit of substance to the bite just as I was thinking, oh these are almost too light. Nope here came oatmeal to say, wait a minute there missy - too light? I think not, here is a bit of down to earth flavor for your little teeth to mull over. They were not too light - not too heavy - just right. If you are so foolish that you do not own this book, you can find the recipe on Patricia's lovely site: Life with a whisk. I elected to bake the coffee/cardamom variation of this week's selection. Cardamom is fast becoming my very favorite spice. I don't know what my very favorite spice used to be, but now it is far and away cardamom. Lemon is still my favorite flavor profile, followed very closely by mint and then chocolate - but cardamom is such a delightful spice - it works so well in both the sweet and savory world, how can it be beat? And, when paired with coffee? As Tony the Tiger would say . . . it's terrifficcccc - I have no idea how many rr's ff's or cc's Tony would have inserted so I have randomly sprinkled my word, terrific, with so many that I had to use a dictionary to remember how to properly spell it when I wanted to use it correctly! As per usual, I got carried away when it came to the marbling, so I ended up with something more asking to blobbing it. My bad. The taste of the cardamom was wonderful, but it really overwhelmed the coffee flavoring. The scent of the coffee was there, but the flavor of the coffee was essentially non-existent. I'll up that ante when I try this cake again. Carol from The Bake More was our hostess and she posted the recipe on that blog, but you purchased the book, right? Life is too short . . .